It appears that Che Mills is indeed headed to UFC 138 for his Octagon debut. He will face “The Ultimate Fighter” Season 13 alum Chris Cope on Nov. 5 in Birmingham, England. “Che Mills signs with the UFC, debut is at UFC 138 in Birmingham vs TUF semi finalist Chris Cope! !” representatives at Team Trojan FreeFighters tweeted on Monday. His manager, Paul Hennessy of Showsport International, on Monday confirmed the fight to MMAWeekly.com. The announcement seems to be a definitive answer to the questions about who and where Mills would fight next. There has been some controversy surrounding Mills since it had been public knowledge and he had publicly talked about fighting Joey Villasenor next on Sept. 10 at BAMMA 7, also in Birmingham. The talk all changed when rumors surfaced of his promotional debut at UFC 138 against Cope. Mills participated in the Team USA vs. Team UK edition of TUF, but didn’t pass the elimination round. MMAWeekly.com sources were initially a mixed bag of some confirming the UFC fight, but others tying Mills to BAMMA 7, with Mills himself remaining silent. The controversy swirled stronger when we received conflicting statements from BAMMA and Mills’ camp. 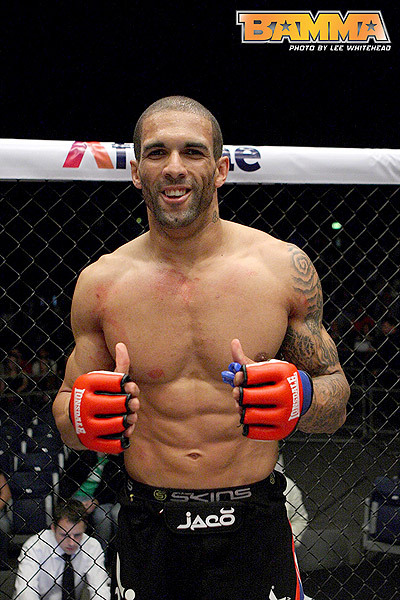 “Che Mills is under contract to BAMMA and is scheduled to fight Joey Villasenor at BAMMA 7. Che has not been and will not be released by BAMMA,” Liam Fisher, head of business development for BAMMA, told MMAWeekly.com on Saturday. Hennessy countered late Saturday night, telling MMAWeekly.com, “I can confirm that Che Mills is not under contract to BAMMA, he does not have a promotional agreement with BAMMA, and has not signed a bout agreement for BAMMA 7. So, while there are still some questions regarding his contractual status with BAMMA, Mills’ camp obviously believes he is free to fight at UFC 138. When asked for further comment on Mills’ contractual situation, BAMMA officials had no comment at the time of publication. Stay tuned for MMAWeekly.com for more UFC and BAMMA news as this story as it develops.